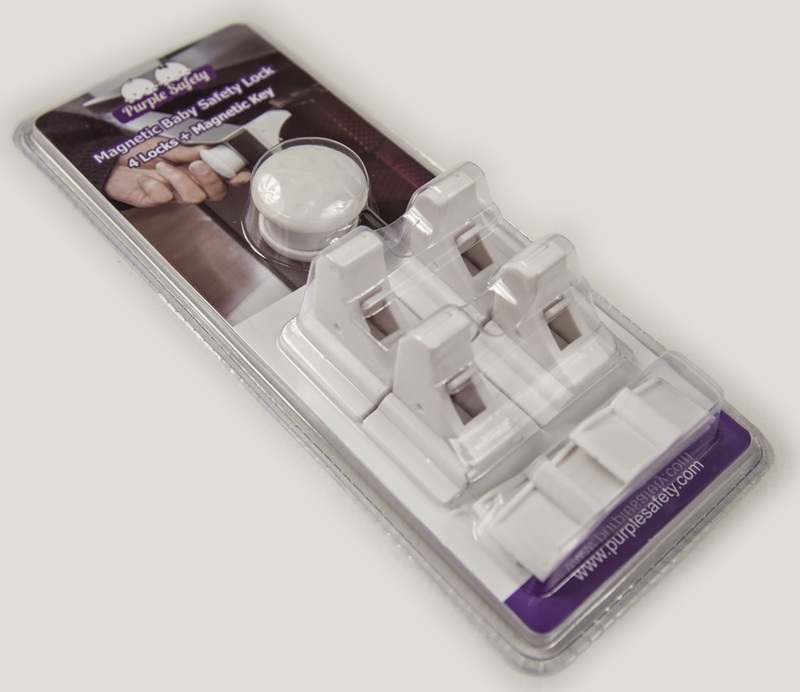 Purple Safety Magnetic Baby Safety Locks #Review + #Giveaway! If you have children in your house, then you know how challenging baby proofing all of the furniture and cabinets can be. I swear, everytime I think I have it all handled Lindsey grows just a little more, gets a little more curious, or can pull up on something new and the cycle begins again! Right now our challenge is a large armoire that is in her playroom and has 10 different drawers across the front. For several months she was content to leave it alone (we placed several toys in front of the drawers to deter her), but now she just moves the toys out of the way and pulls drawers open to start removing papers, markers and linens so she can "decorate" her play room with the contents. So these magnetic safety locks were a HUGE necessity for us, and have worked very well to help us secure the drawers that she tends to get into the most. After a few tries of tugging on a drawer handle and realizing it wasn't going to open Lindsey seemed content to move onto something else thank goodness! I love that there are no screws involved in the installation of these locks - so no damage to your cabinets or drawers which is fantastic. Use the double sided sticky tape to attach the two pieces once you've lined them up and you're all set! I am so excited to share a set of these magnetic locks with one of my readers! Make sure to enter via the rafflecopter widget below and good luck! WHAT YOU GET - 4 keys and 1 magnetic lock that opens them all. 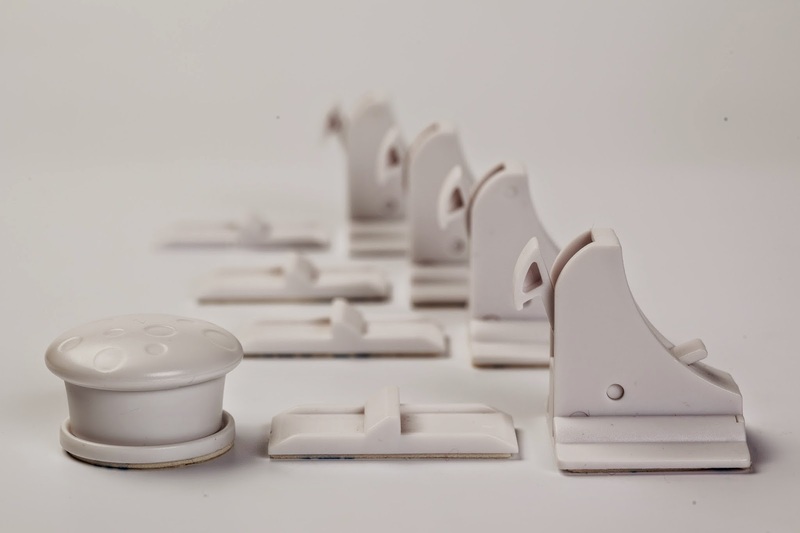 FITS ALMOST ALL CABINETS AND DRAWERS - The magnetic key is made from a rare earth magnet and would even work on 1.5 inches thick cabinet door or drawer. ABSOLUTELY NO RISK INVOLVED - At Purple Safety, we fully stand behind our product and offer you a no-questions-asked, 100% SATISFACTION MONEY-BACK GUARANTEE. If you don't love our Safety Magnetic Locking or if you don't feel 100% satisfied, we will refund your money. Customer satisfaction is our number one priority. *Full Disclosure: I received complimentary product from Purple Safety for the purpose of review. I received no compensation for this post. All comments are 100% accurate and 100% my own. I would use these in my kitchen or bathroom! I would love to win and use these in the kitchen! I would use them in my kitchen and bathrooms on the doors and drawers. I would use these in the kitchen and bathrooms. Thats where we keep all the cleaners and things. I could use them in my kitchen! I would use these on the kitchen cabinets. my sister is in the process of getting approved to foster a little one and this would be great for her home-study and for when she is approved! THE BATHROOM AND KITCHEN WOULD BE THE MAIN STARTING PLACES. I AM SURE THAT ALL ROOMS WOULD HAVE A USE FOR THEM. We would definitely use them in the kitchen and bathroom. I've got a china cabinet with some lower drawers/cupboards that I didn't want to put screws in, so this would be great for that! I would use these on the cabinets under my sink where i keep all the cleaning supplies! I would use them in my kitchen! I could use these in our laundry/mud room. I'd use these on my kitchen cabinets. I would use these for all of my cupboards as I have a little boy that I watch during the week and he is always trying to get into the cupboards. I would use these in my kitchen. I have a 2 year old son and am expecting a baby girl in July. We could use this on our living room furniture cabinets. I would use these in my bathroom! In the bathroom where I have my diaper changing area. In the kitchen under the sink. I would use them on our kitchen cabinets. I would use in the kitchen and bathroom. I could use them in the kitchen! Thank you. I would use these on our media console. We are expecting a new baby and need theseforourcabinets! I could use these in my kitchen. I would use them in the kitchen. These would be great for the kitchen or bathroom. I would use them in the kitchen and bathroom. I would use these in both the bathroom and kitchen to help out. You have discussed an interesting topic that everybody should know. Very well explained with examples. i have found a similar websiteHome Safe visit the site to know more about Access Controls Melbourne.